Those of you who live on the west coast and have seen this species in their native habitat on mountain sides will probably be pretty jealous of the height of this individual on campus. 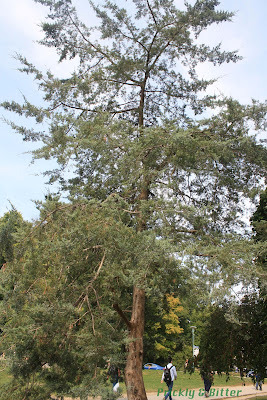 It was probably planted when Talbot College was built in about 1970, so the tree would only be 40-50 years old. It's already much taller at 50 years than other individuals would be after 750 years or more! Just goes to show that when you plant species outside of their native habitats, strange morphologies can be achieved. Like all gymnosperms, the "berries" produced on the branches are not fruits, no matter how they might appear. Gymnosperms, unlike angiosperms, do not have flowers and so don't have all the layers of tissue required to produce a true fruit. Despite this fact, ginkgo (which you can read about HERE), yews (which you can read all about HERE and HERE), and junipers all produce berry-like "fruits" that are just modified seeds. The outermost layer of the seed is modified to store starchy and sugary compounds, often with a lot of waxes and resins to protect the seeds from predation by small animals, and are produced instead of cones. 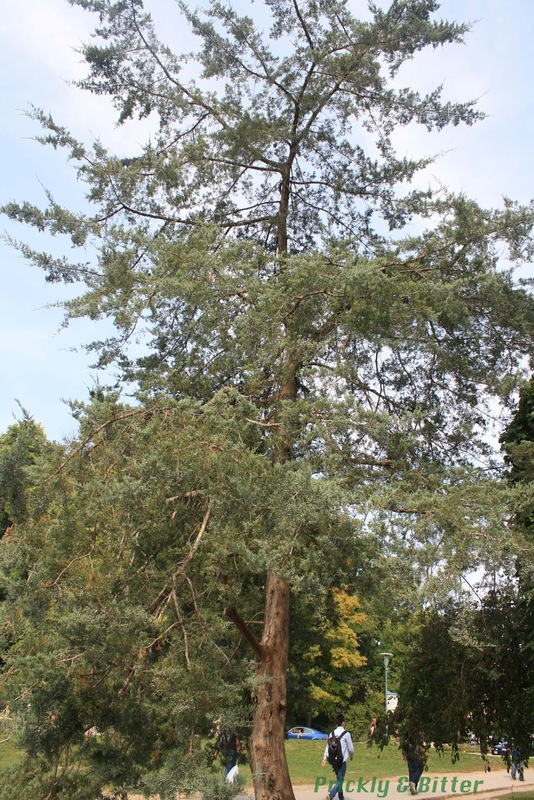 Another interesting fact to note about this species of juniper is that, like ginkgo and holly, the tree is either male or female but never both. The bright blue modified seeds are produced on the female trees, and the male trees have pollen cones that are produced in the spring and release all of their pollen into the air right around spring allergy season. It seems like in the spring and fall, all of the trees conspire against humans to irritate our airways! 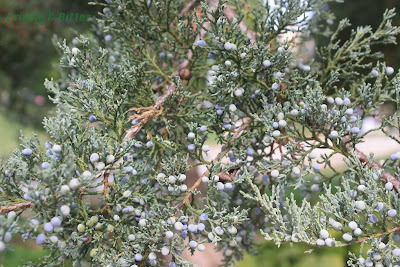 Sometimes the blue berries are produced regardless of whether the male tree is present or not, but the seeds inside will not be viable. Like holly and ginkgo plants, if you want to ensure the success of the seeds you need to plant both sexes in close proximity. 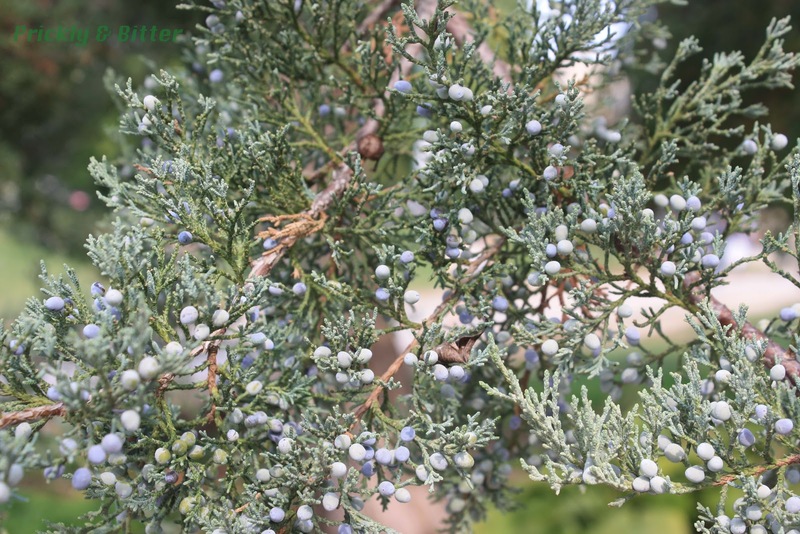 Many junipers have traditionally held a strong importance in the lives of native North Americans due to their medicinal value. 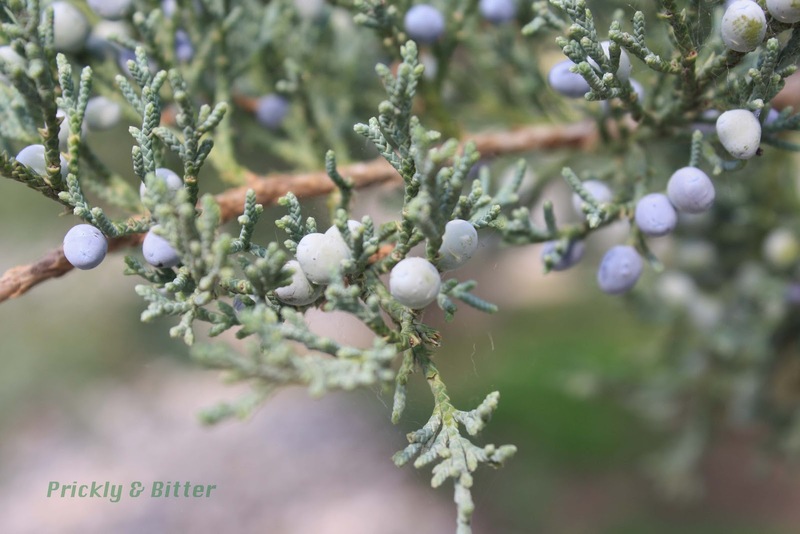 The bark of the Rocky Mountain juniper is boiled to make a tea and consumed to treat coughs and fevers. Since there are so many resins produced by this species (the yellow "sap" that drips down the outside of the tree, especially after the tree has been wounded) have great antimicrobial properties, and are actually the very reason the tree produces them in the first place! I have strong suspicions that any time the bark of a gymnosperm is cooked to extract the resins then consumed, it will have a strong effect against bacteria in the mouth and throat. This doesn't mean you should attempt this, however; some resins produced by various species of gymnosperms are highly toxic and should never be consumed! It's always a fine line in herbal medicine between things that will make you very ill and things that will help your sickness. Mixing your own concoctions just to try things out is strongly discouraged.